Blair Turgott is hopeful of following in the footsteps of his former England teammate, Raheem Sterling. He said in an interview with thefa.com: “You only have to look at Raheem to see how well he’s done this season and that is an inspiration to all of us. “He was with us in the U17s last year and for the first U19s game in Germany, so if you get the chance, you have to take it,” he added. 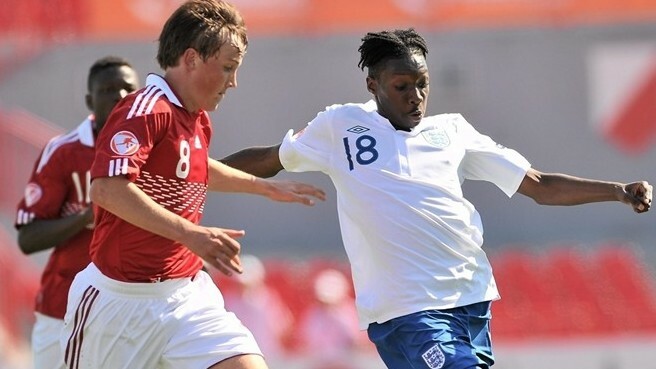 Turgott and Sterling both debutised for England at youth level when they played for the Under 16s in a Victory Shield match against Northern Ireland in September 2009. Noel Blake’s side take on Finland tomorrow and Turgott is in the side hoping to add experience. He has played over 25 times for England through U16, U17, U18 and U19 level including playing in the European U17 Championship and the FIFA Under 17 World Cup in Mexico. His most recent performances for the side though were in Estonia where the Under 19s qualified for the Elite Round of qualifying for next summer’s European Championships. Turgott reflected: “It’s been good for me, because you get to experience playing away from home and going to other countries and continents and playing football out there, which is a great experience for me now and my career going forward. “It was a good trip out to Estonia and I thought we did really well as a team to come out on top of the group and qualify. “Estonia is a country you wouldn’t necessarily go to otherwise under other circumstances so it was another little trip and experience. Hello friend give up and get a real job. Turgott get a life son. There is only one Raheem Sterling – a real master class player.U little stupid U Get me!! !